D.P.J. Coating Systems Pty. 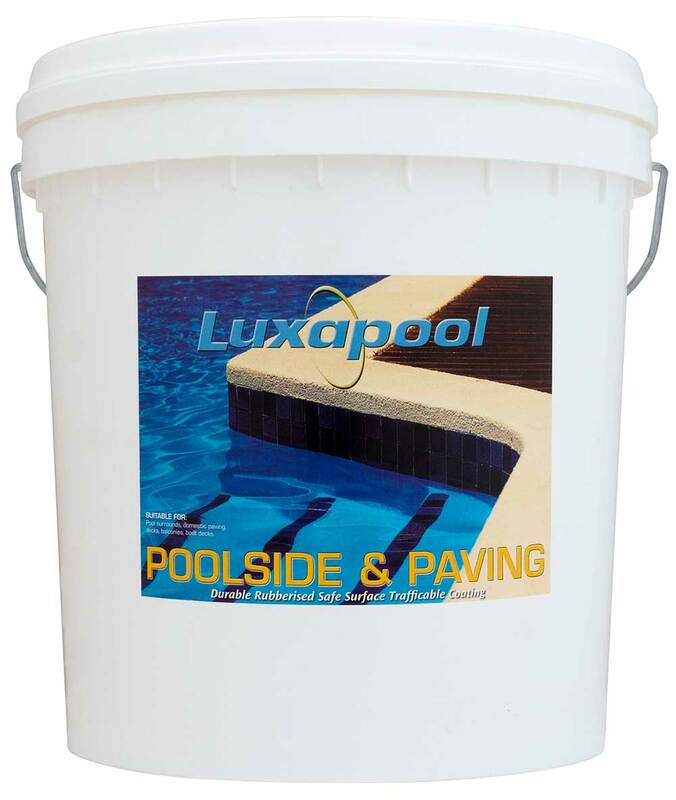 Ltd.
LUXAPOOL® Poolside & Paving is a water-based, rubberised, non-slip coating system that is easy to apply and provides a safe and durable decorative surface for most small pebble, concrete and paved areas. It may be easily varied during application to a range of ‘non slip’ effects. LUXAPOOL® Poolside & Paving is available in a range of 15 stylish colours (see colour card here) and will adhere to most mineral surfaces including, pebblecrete, aged concrete, cement render, masonry, fibre-cement sheet and unglazed tiling. Use of Acrylmeric Superseal Primer is recommended as the first coat of a systems approach to ensure maximum adhesion to such surfaces. A clear glaze is also available for improved stain resistance and easier maintenance. Want to buy your paint now? Luxapool Victoria (D.P.J. Coating Systems Pty. Ltd.) seeks to provide consumers with an informative and interesting site full of details about new and current D.P.J. products. At all times D.P.J. will use its reasonable endeavours to ensure that all information is accurate. The site will be updated regularly by the D.P.J. sales and marketing teams. However D.P.J. provides no warranties in regard to the accuracy of the information. D.P.J., and any of its associated companies will not be liable for any direct, incidental, consequential, indirect or punitive damages, costs, losses or liabilities whatsoever arising from use of this site. This disclaimer includes any damages, losses, costs or liabilities arising from a virus that is activated as a result of access or use of this site. Please note that any personal details forwarded to D.P.J. by a user become the property of D.P.J. and can be used without consent. Copyright. Graphic Imagery and text selections and all product information are Copyright © 2004, D.P.J. Coating Systems Pty Ltd. ALL RIGHTS RESERVED.